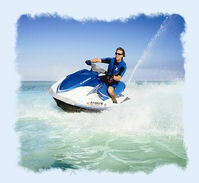 Have a Blast with a Jet Ski Rental! One of the most popular activities in Key West is a jet ski rental. It's a great way to take part in a water sport activity on a hot day and have loads of fun! Most of the Key West jet ski rental outfiiters will offer a guided tour around the island, usually lasting between an hour 1/2 or two hours. They will also charge by the hour if a jet ski tour is not on your bucket list. This usually entails staying in a designated area if you are not doing one of the tours. Any one looking for a jet ski rental in Key West should be aware that the minimum age is 18 and anyone under the age of 25 needs to have a Florida boating license. Fortunately you can take a test before your schedule ride for just $4. Your license will then be good for up to one year. All of the wave runner outfitters will offer this test when you arrive. SUNSET WATERSPORTS - Featuring New Jetskis Every Year! Located just a short distance from our vacation rental condo is Sunset Watersports. Sunset has two convenient locations to choose from for most of their watersport activities. They are located right next door at Smathers Beach on S. Roosevelt Boulevard & their main home base at 201 William Street right by the Key West Seaport. Sunset features one of the islands largest selections of watersport rentals and activities. When it comes to watersports they are definetly number one. They also offer some of the best rates and special offers of any of the watersport companies. Sunset features a large selection of state of the art jet ski rentals. You're assured of a quality ride with Sunset since they replace all their jet-skis each year with the latest and greatest new models. Take The Island Jetski Tour! They offer the best value and they don't charge extra for gas or a second rider like many of the other rental companies. You can either rent by the hour or join one of their guided tours for a two and a half hour scenic adventure around the island of Key West. 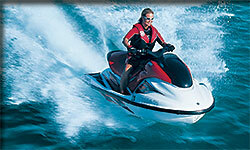 Key West's First Choice for Jet Ski & Boat Rentals Key West's number one Jet Ski Rental Company! FURY WATER ADVENTURES -- THEY HAVE IT ALL! Fury Water Adventures has everything you will need for any water sport you might want to partake in. They are one of the larger watersport companies on the island. Experience the thrill of flying with a parasailing adventure (single or tandem rides) or join them for one of the many family adventures they offer that are both safe and fun. Other adventures include: jet ski rentals, air conditioned glass bottom boat tours, eco tours, kayaking, snorkeling, rock climbing, water trampoline, and sunset cruises. SEBAGO CATAMARANS & WATERSPORTS - All Inclusive Tours Available! Sebago water sports offers practically every water activity known to man plus a few others. They include parasailing, snorkeling, jet skiing, deep sea fishing, flats fishing, party boat fishing, sunset sailing, women only sunset sails, dolphin encounter tours, electric car rentals, kayaking, and the all inclusive Island Ting adventure. Aquatic Boat Rentals -- Island Tours & Guide Service Available! Aquatic Boat Rentals features a number of late model high performance jet ski rentals to choose from. Aquatic offers both single or tandem machines. 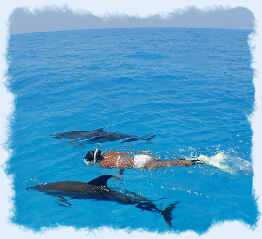 They also offer one of the very popular island jet ski tours. You will explore the islands around Key West with a seasoned guide who will lead you on a fun and scenic adventure. 1/2 day or even a full day, which some of the rental companies do not offer. Aquatic Boat Rentals is located on the east side of stock island at the Murray Marine just off highway US1.